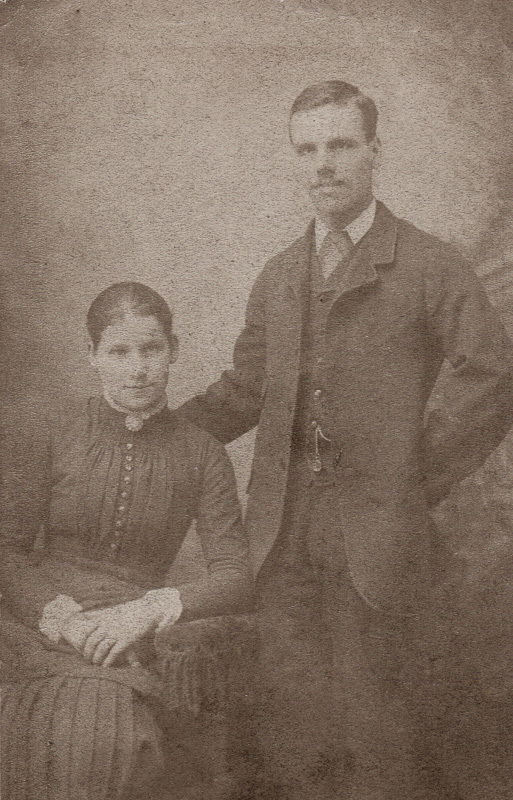 This is the only photo I have found of my great grandparents, William and Annie Baker. As you can see, the quality is poor, but the original is much, much worse; it’s barely recognizable as a photograph. I was able to get it in this condition only with some help from Photoshop. I hope I can eventually find some more pictures of them. William was born in Bridgwater, Somerset, England in 1862. I don’t have any information about his family. There were several William Henry Bakers born in that area at about that time, and he could be any of them. Or, he could be none of them, as my Aunt Joan once told me she thought William was adopted. Annie was born in Bason Bridge, Huntspill, Somerset, England on November 29th, 1864 as Elizabeth Ann Knapton, the daughter of Eri Knapton and Elizabeth Coles (Padden) Knapton. I don’t know how William and Annie met. William apparently was in Wales to work in the coal mines. I found an 1881 census record that showed Annie was a lodger with a family in Wales, and was an apprentice dressmaker, but I am not certain this record referred to the same person; there were other Ann and Elizabeth Knaptons living in the area, so it could have been someone else. Whether they met in England or in Wales, they were married on March 2nd 1885 in Porth, Pontypridd, Glamorgan, Wales. All of their children were born in Wales, but only four of the eight survived childhood. William and Annie moved their family to the United States in February 1912 (see my post about that move) and settled eventually in Penn Yan, New York. Unfortunately, William did not live long after the move. He died in an accident at the Taylor Chemical Mill in May Mills, New York on July 2nd 1913. Annie, however, went on to live to the age of 68, and passed away at her home in Penn Yan on 19 Aug 1933.